It is certainly not the best of times to run a hospital. Negative profit margins, complicated insurer algorithms and high operational costs are making practising medicine a nightmare. PracticeBridge Inc. offers revenue cycle management services for hospitals in Connecticut. We understand US billing regulations and have the depth of experience required to lighten your workdays and improve bottomline benefits. Have you hit a blank wall? Sometimes feeling motivated enough to step out of your front door can be tough. Are these challenges driving you round the bend? Enjoy the cost and time savings of working with a remote biller, with the ease of working who sits a few paces away. Our hospital revenue cycle management services will reduce your cost to collect, eliminate AR backlogs, drive up net collections and help you track productivity KPIs. 6 reasons why it makes sense to work with us. 5. With the rise in Medicare enrolees, expertise in handling secondary insurance claims is essential. PracticeBridge Inc. offers both primary and secondary insurance billing services. 6. We work 24/7 so you save 16 hours every single day. Our 7 specialist RCM teams optimize and maximize the productivity of every phase of your revenue cycle. 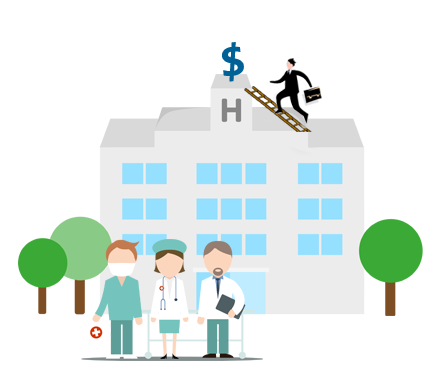 Are you tracking your hospital's KPIs? theBillingBridge is a realtime KPI tracking and revenue reporting app built to work in the smartphone environment. It will help hospital CFOs to track the productivity metrics of every physician who works in the hospital. Highly detailed, physician specific reports are generated. Run comparison charts and set benchmarks with our user-friendly app. Detailed appointment summaries of individual physicians are also provided. theBillingBridge is packed with several smart features such as Medicare fee schedule impact analysis, RVU analysis and claim cycle tracking options. Raise and resolve queries with the QueryTracker and send tickets within the application. Intrigued? For more info click here.